Do Twins Act the Same In Utero? When I found out I was pregnant with twins I was thrilled, scared and taken aback by the natural gifts in life. We had a few scares early on, which caused us to have ultrasounds every doctor's visit. After just a few months we noticed a pattern in utero that was something I never expected. 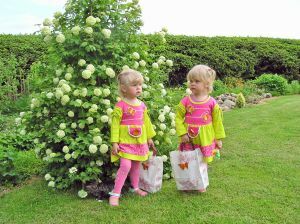 Twins can act completely different even before they are born. Twin A was the rambunctious one. She (which we did not find out until she was born because she constantly eluded the ultrasound) was on a constant karate trip. I remember one ultrasound in particular when she was kicking and flailing all over the place and Twin B was just sitting there not moving at all. Fear filled my heart – was there something wrong with Twin B? Come to find out, he was just the quiet one in the belly. Twin B was the son we'd been trying for, but he wasn't the ball of fire his sister was turning out to be. Every ultrasound he was just floating there. He was always positioned in the same place and often looking directly at the ultrasound camera. You could see his little body move as his sister practiced another round of kick boxing, but he never stretched, kicked back or even turned toward her. After birth we quickly realized that the attitudes the twins displayed in utero were the same attitudes they displayed in life. Twin A was constantly on fire always wanting to move around, kick, roll. She talked first, crawled first and walked first. Twin B, on the other hand, was quiet and reserved. He was not in a hurry to do much of anything, especially walk. My twins are now pushing 9 years old and they act exactly the same. Twin A is the athletic one – she's always running around doing some sort of gymnastic activity. Twin B is the quiet, thoughtful one – he's rarely heard talking loud and prefers quiet play to active play. Previous: Can My Baby Girl Be Having a Period?